We came, we ate, and we are happy! 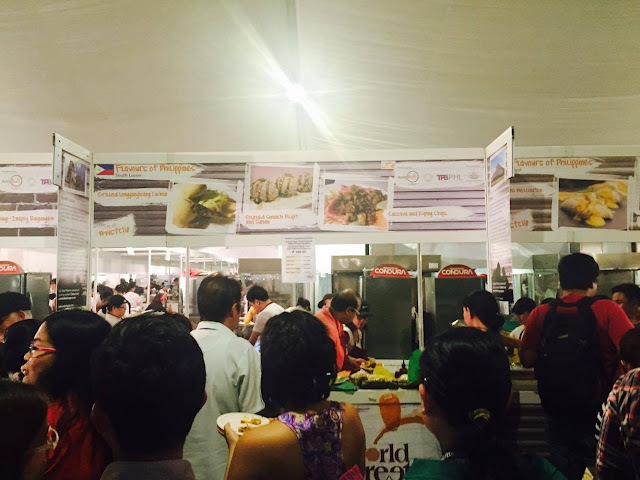 That's how I will sum up our experience at the World Streetfood Congress here in Manila. 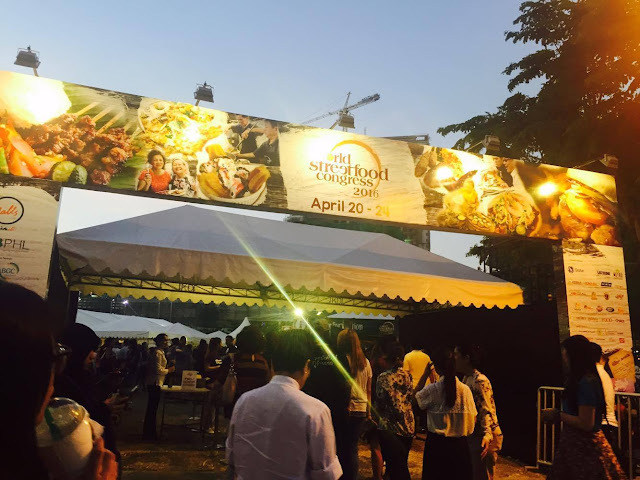 It was past 6pm when we arrived at the World Streetfood Congress 2016 in BGC, Taguig City. The place is quite full when we got there and after about 30 minutes, it was announced that they are temporarily closing the gates since it has already reached its full capacity (5k pax if I'm not mistaken). 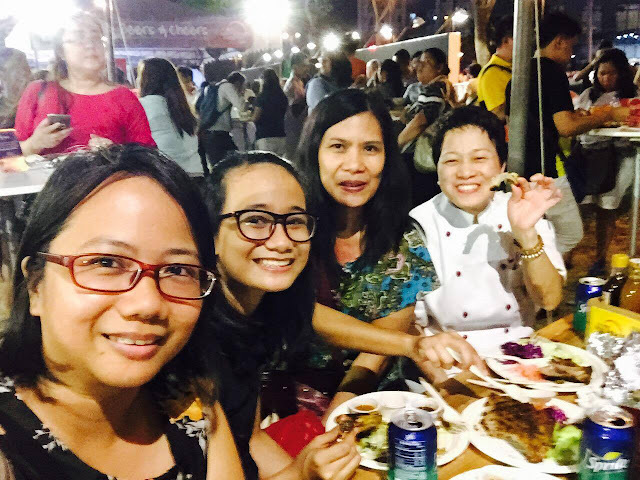 Everyone was giddy with excitement and checking out the food stalls like what we did fist before choosing what to eat. These claypots are used to cook Vietnamese seafood pancakes called Banh Xeo. 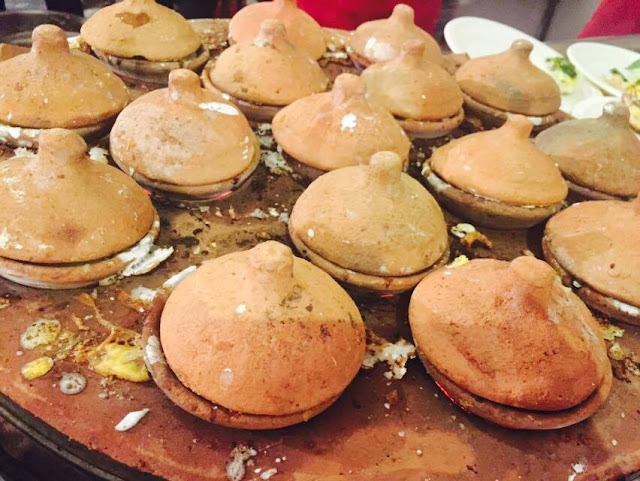 The claypot and the way it is cooked adds flavor to the pancake. Lines was really longish in this food stall but if I will have a chance to come back, I'm definitely falling in line. 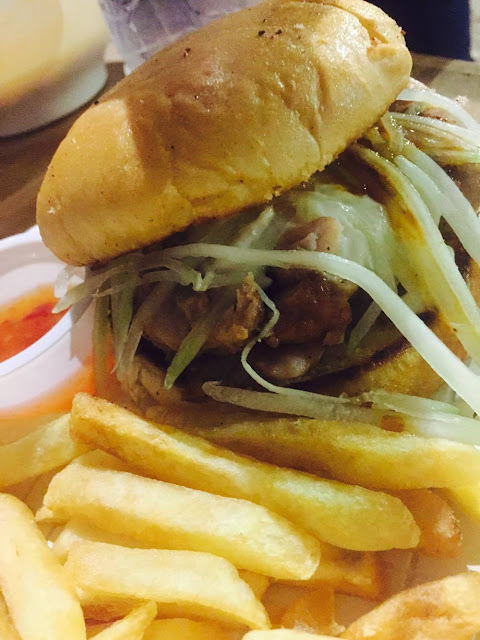 Har Cheong Kai Burger (P300) at the Hong Kong food stall. 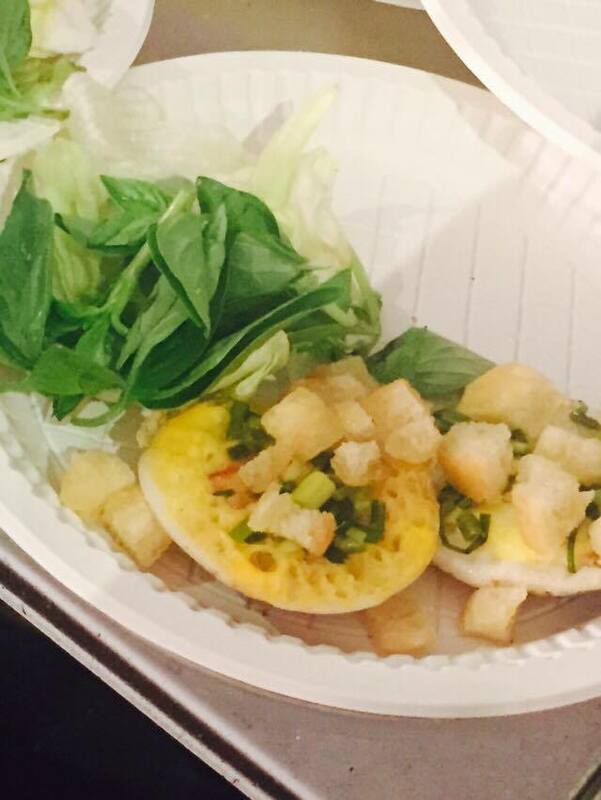 Patty is made from chicken and it has shrimp paste, and has onions and lettuce. 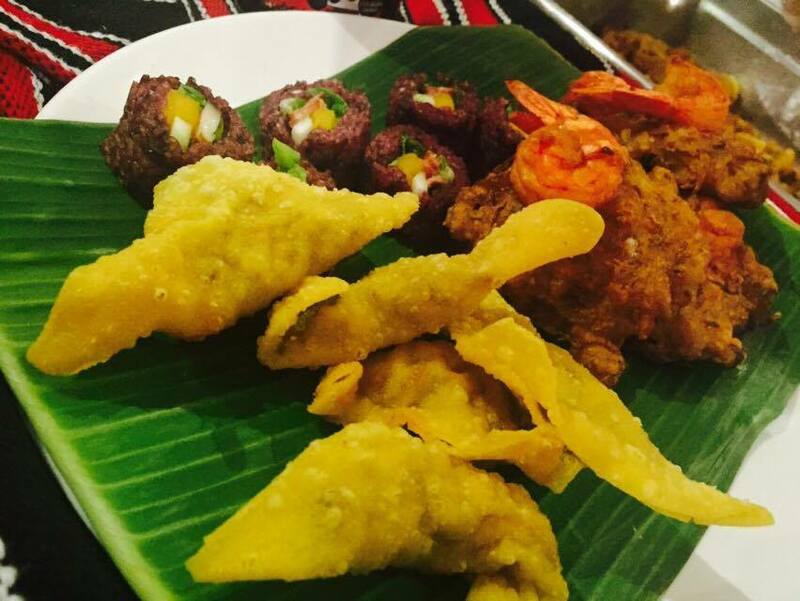 The shrimp paste is nothing like our salty "bagoong," though. The shrimp paste is creamy as if it is mixed with yogurt, not salty but there's a hint of "sweetness." The chicken patty was also very tender so maybe it was marinaded overnight, and it tasted broiled, not grilled. Daughter liked this alot, I just had a bite and she ate the rest. 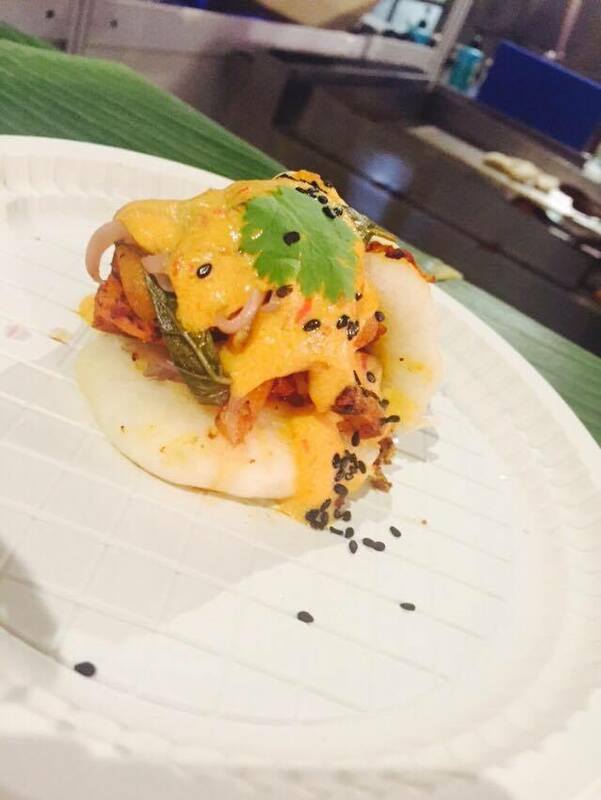 Smoked Chili grilled Tofu Bao (P160). It has tofu, kimchi and sriracha aoili. 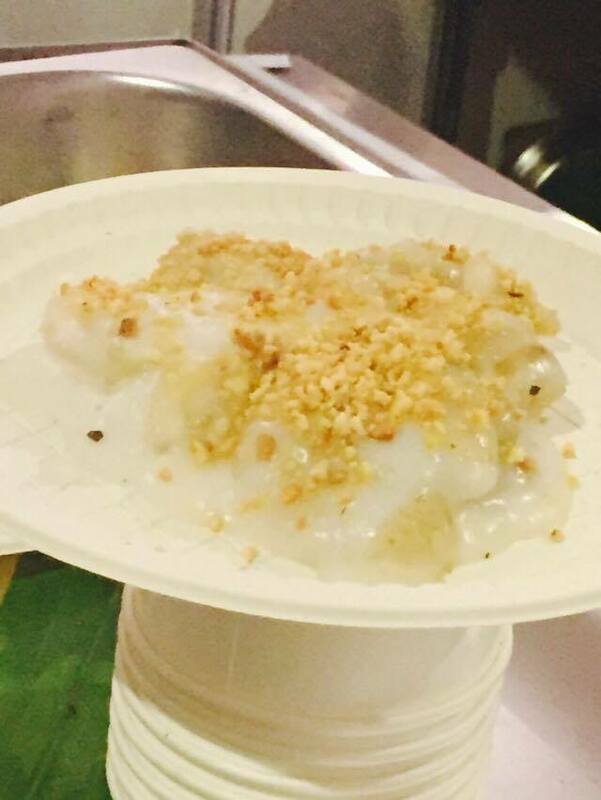 A gourmet-looking streetfood dish. Thumbs up! Haha, just look at the photo. These are called Bali BBQ (Balinese) Ribs (P300). Its tender although not fall-off-the-bone-tender. Very flavorful also. Aside from the side salad (shredded cabbage and lettuce), and it has some chili sauce. I was expecting it to be super spicy but it isn't. Maybe they toned down the spiciness? 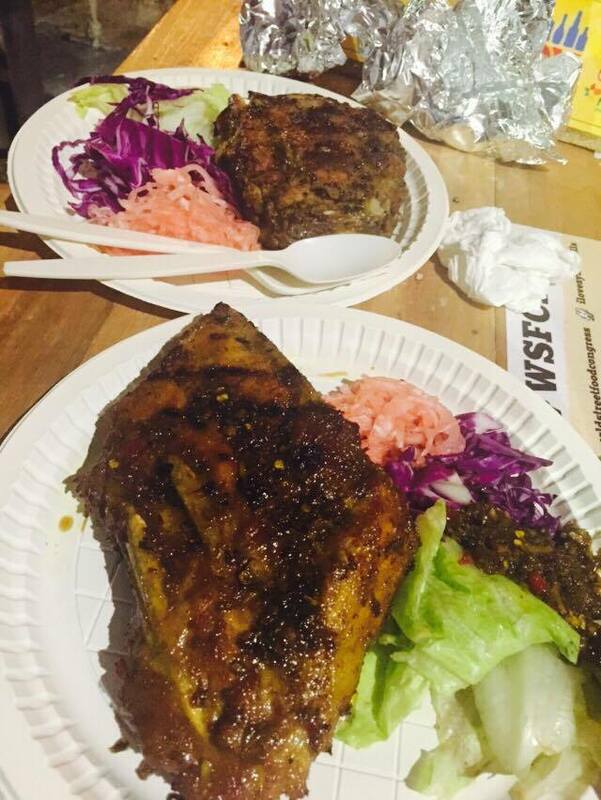 Btw, this ribs food stall has one of the most longest queues at the World Streetfood Jamboree but it is super worth it. Here's another interesting looking plate from Northern Philippines. Okoy, Panara (that's the fried dumpling filled with shredded green papaya), and Kiniing-Inapoy Bingungen (sticky rice, smoked pork, ripe mango, cucumber). Braised Zhu Hou Chicken. The chicken is braised in foshan sauce (soy bean, salt, sugar, sesame seed, and light soy sauce). It's Hainanese chicken. 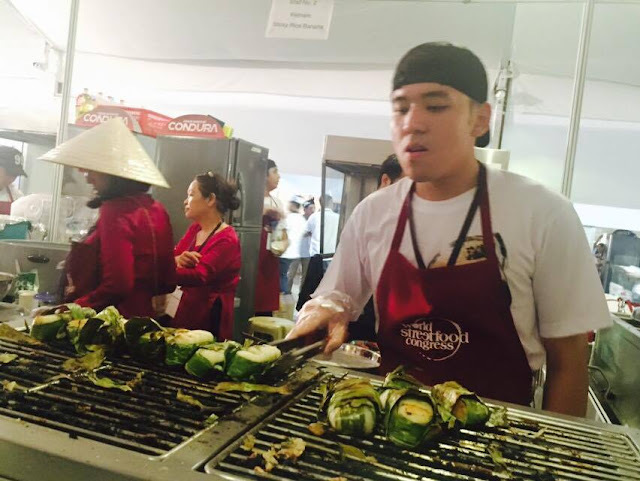 This guy is grilling sticky rice called Nam Bo at the Vietnamese food stall. 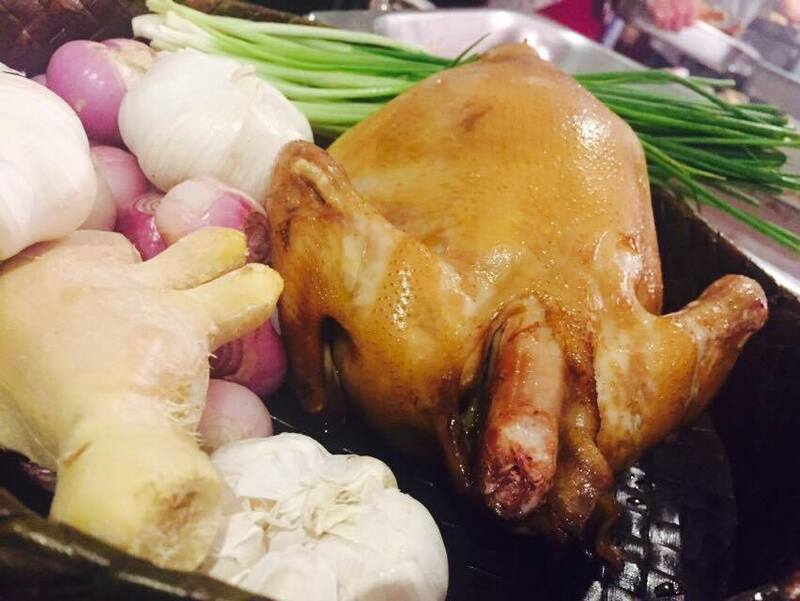 This is what Nam Bo looks like after being grilled. Mee Siam (P300). 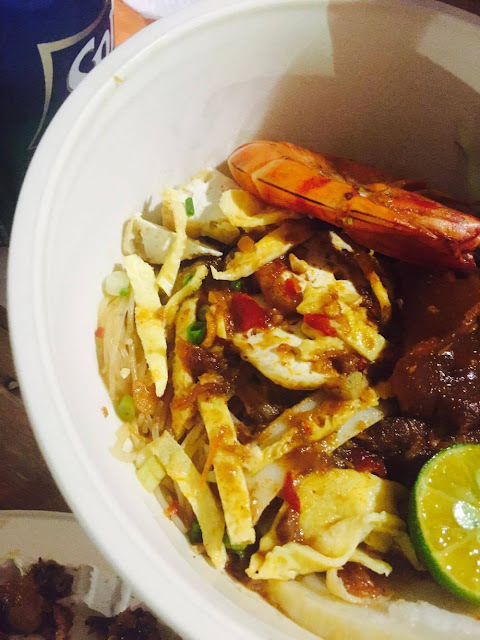 This is a Malaysian noodle dish similar to our pansit except that it has chilis, used a different kind of beehon, and has tons of herbs and tamarind sauce. Thumbs up for this! Btw, don't squeeze calamansi on it because it will taste like our local pansit. Better with lime (imo). Seafood Tempura (P300) with 3 Singapore Dips (chili crab, black pepper, and salted egg yolk dip). This is my heaven on a plate. 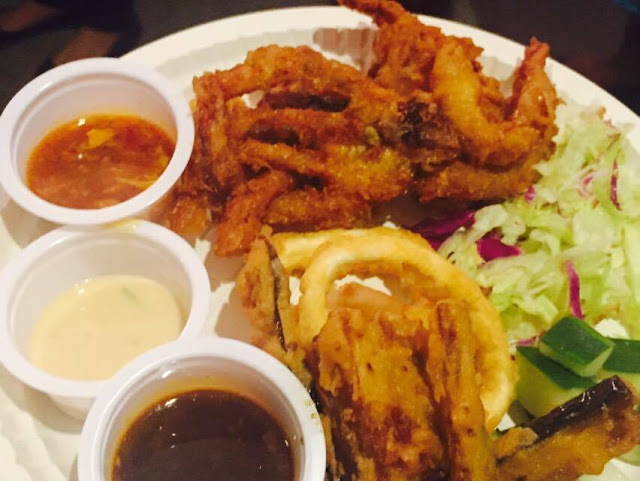 There's soft shelled crabs and squid, eggplant, and a side salad of shredded cabbage and cucumber. 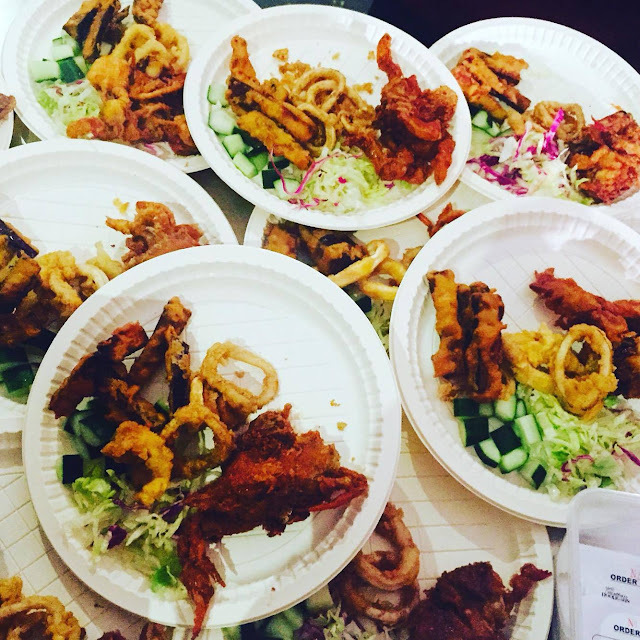 I love the soft shelled crab, so good especially when paired with the salted egg yolk dip and the chili crab dip (I mixed the two, although my daughter favored the salted egg yolk dip since its not spicy). Btw, the chili crab dip is not that spicy at all but it does have that right "punch." Here is the Philippines food stall- they are serving Grilled Longganisang Lucban, Glazed Squash Pilipit, and Cassava and Kipping Chips. I haven't had kipping for ages. Kiping are flat crackers made from rice flour. It can be fried or grilled. It is similar to "papadum." Another Philippine food stall is Pepitas Lechon and there's another one with the "sili" ice cream. Definitely a mecca for foodies! I mean, you get to sample streetfood from 9 participating countries without going out of the country and spending on airfare. However, patience is required you need to fall in-line A LOT. From going inside the World Streetfood Congress, and then fall in line again in every food stall. You can't also bring in drinks from outside (you need to purchase drinks at the food jamboree). Food costs between P180-380. There's a clean-as-you-leave-table policy, and try not to stay too long on your table so that others can sit down also. And don't forget to bring a fan because it is so hot (warm food + warm bodies + summer), and wear comfortable clothing. Keep in mind that this is not the usual streetfood that we are familiar with (isaw, bbq, kwek-kwek, etc) so its time to be adventurous with your food choices. Also, if you are going there in the evening, be prepared for the unexpected like not being allowed to go inside the World Streetfood area because the venue has already reached its maximum capacity or being told that the food that you want to order are already sold-out (that's after falling in line for ages).